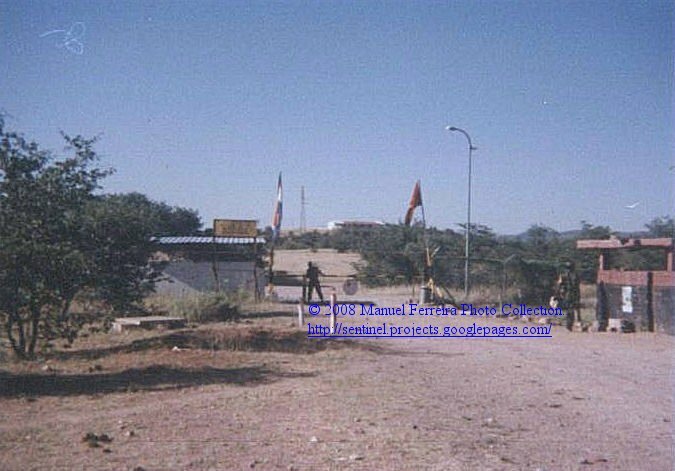 In the morning of December 20 1988, a pair of FAPA (Angolan Air Force) MIG - 21 MFs took off from Lubango, "intending" to make a high level transit flight to Luena AB. 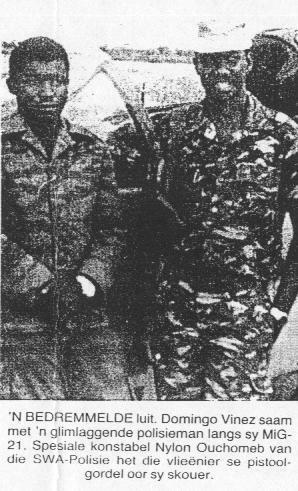 Twenty five year old Ovimbundo (Genl Savimbi's tribe) Lt Domingos Vinez, was the pilot of MIG - 21 C340. Instead of flying to Luena, he flew south east at about 36000 ft over thick cloud cover. After being airborne for 70 minutes, Lt Vinez carried out a very skilful deadstick landing on the farm Schneider-Waterberg, near the town of Otjivarongo in South West Africa/Namibia. 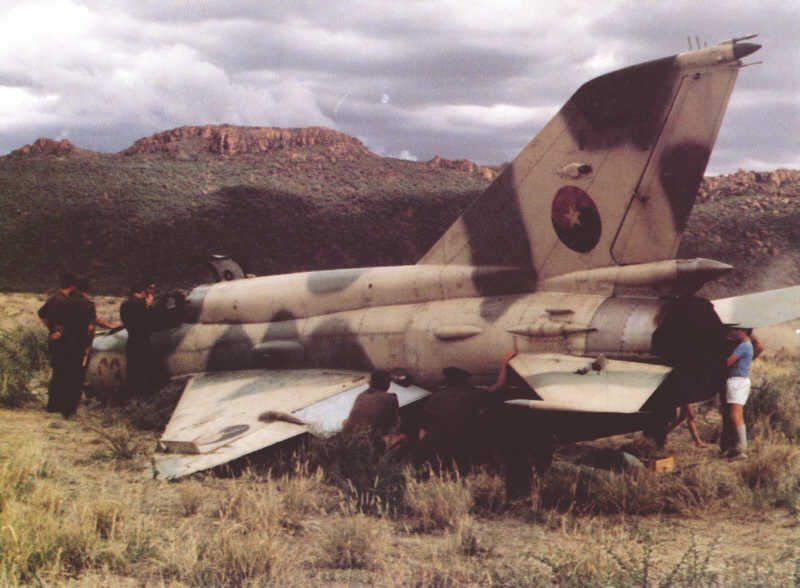 Lt Vinez's Mig 21 after his forced landing in SWA. Author unknown. His fighter's 23 mm cannons had a full load of ammunition, but no missiles werebeingcarried. The Angolan pilot was uninjured and surrendered his service pistol to the local police. Minutes later he was taken prisoner by the SADF. Domingos Vinez on the left, next to a local policeman. Photo taken shortly after his landing in SWA. Photo Rapport. The following day, Vinez was flownto Pretoria and taken to the Military Intelligence College, where I met him. I found him nervous and tried to calm him down, byhaving a casual conversation, and telling him about the plans for the day. Vinez spoke no English, but I found him very well informed about South Africa. The following day, he was taken to aMilitary Intelligence farm/base outside Pretoria called Fontana. Once there, he was again examined by a Military Intelligence medical doctor and found in perfect health, only complaining of a shaving rash. He was told not to shave! His interrogation started. Some days he was not veryco-operative, even to the point of asking us once,if we ever heard of the Geneva Convention. Without ever using any physical measures,our "chief" MIinterrogatorsoon had him talkative. He had been trained in the Soviet Union, was based in Lubango and complained about the discrimination, that the Angolan pilots were subjectedin their own country by the Cubans. Nothing was shared between the Angolan and Cuban Squadrons. The Angolan living conditions, rations, logistics,aircraft,maintenance, etc, were very poor comparing to what the Cubans had available to them. I found him evasive in general, and trying to come across as a person who was not very bright. He was alsoarrogant and unfriendly, to the point of refusing to build a model of his aircraft in his "spare" time, to be displayed alongsideseveral Sovietmodel tanks at Fontana's pub, which had been built bya Cuban POW. Let me add, that while he was our "guest" his living conditions and food were of the best that Fontana had available. He had many lunchs with us, eating at our table. When not having his meals with us, his food was cooked at Fontana's kitchen andwas the same that his SAAF Police guards got. 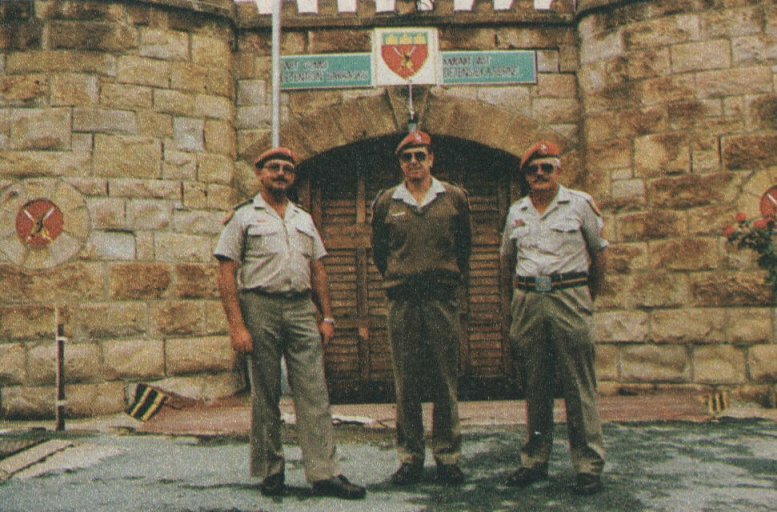 Once MI/SAAF was finished with his interrogation, Vinez was taken to the SADF military detention barracks in Boksburg, where he remained until being swopped for a SADF soldier being held by the Cubans. I said my goodbyes to Vinez in his cellat the Boksburg DB. The SADF interrogation team came to the conclusion, that Vinez got lost after loosing contact with his ground radar station. As a pilot, they concluded that he was below average andpoorly trained by the Soviets. As nobody understood Vinezas I did because of the language barrier, I still have my doubts about his flight intentions that day back in December of 1988. Were Vinez and his partner sent on a mission that day to check the SAAFinterception capabilities? The SAAF claims that the two Angolan MiGs were on their radar screens and that one broke away back to Angola, after also entering South West African airspace. Were there no South African Air Force fighters available that day in northernSouth West Africato intercept the Angolan MiGs? Or was the SAAF certain that the Angolan MiG(s)posed no threat? 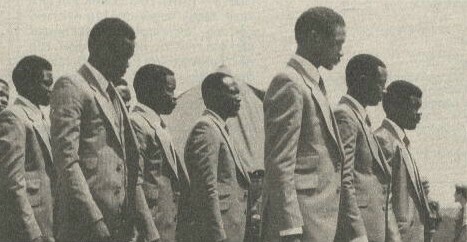 On the 31st March 1989 in Ruacana, Lt Vinez alongside 11 Angolans and 3 Cuban soldiersheld by UNITA, was exchanged for a single South Africansoldier being held by the Cubans, Private Johan Papenfus. 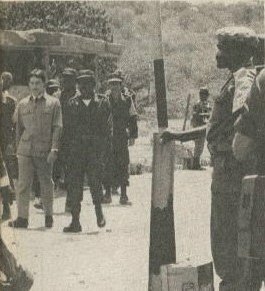 SADF Rfn J Papenfus, being walked by FAPLA officers into SWA, to be exchanged for Vinez, 11 FAPLA servicemen and 3 Cuban soldiers. Photo PARATUS. The group of 12 Angolans and 3 Cubans which included Vinez. 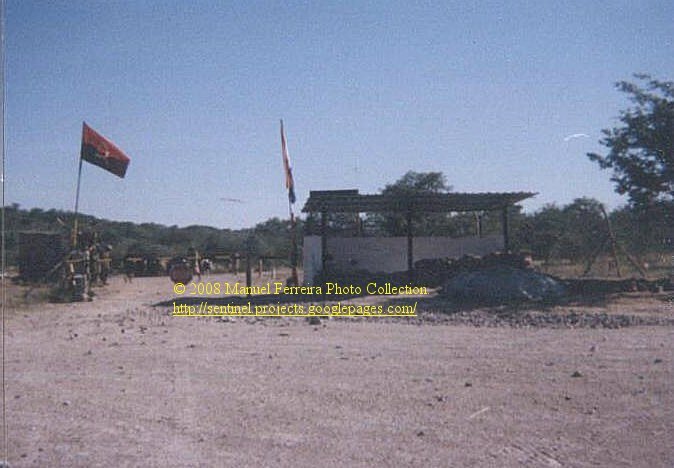 Photo taken on the South African side of the border at Ruacana, few minutes before the POWs exchange. Photo PARATUS. Rfn J Papenfus after being exchanged for Lt Vinez. 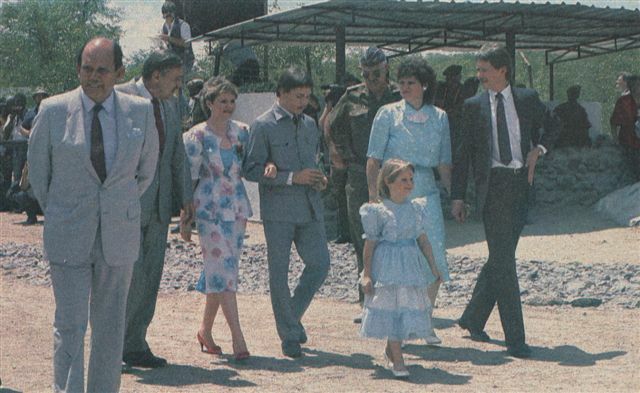 Johan Papenfus, is welcomed on the SA side of Beacon 1 by his family, the Ministers of Defence and of Foreign Affairs. Photo Paratus. Marco 1/ Beacon 1- Calueque, where the POW exchange took place. Beacon 1 was staffed by the last JMC (Joint Monitoring Commission), combined FAPLA/SADF force. Soldiers of 32 Battalion were assigned to Marco 1. The Angolan MIG - 21 MF Fishbed C340, is on display at the SAAF Museum in Pretoria. The Angolans never claimed their fighter back. Visits to this page since 24 May 2008.